PTWC's near real-time animation for the tsunami from northern Chile on 1 April 2014 resulting from an offshore 8.2 magnitude earthquake in the region. The animation shows simulated tsunami wave propagation for 30 hours followed by an "energy map" showing the maximum open-ocean wave heights over that period. When the Manchus ruled China, it was given the name South Sea—a maritime domain dotted with islets, atolls and lagoons that provided storm shelter for fishermen. China's 1947 map depicting the "eleven-dotted-line"
What today's atlases call the South China Sea received its English-language appellation, and its coordinates, under a 1953 document entitled Limits of Oceans and Seas published by the Monaco-based International Hydrographic Organization, whose patron is Prince Albert. And it's critical to the global economy. It carries more than half of the world's seaborne trade; connects the fast growing economies of the Asian Pacific with markets in Europe, the Middle East and Africa, and is reckoned to cover vast oil reserves. Yet, in a push that's creating alarm among China's neighbors—and the U.S. —the inheritors of the Manchu empire who now run China are making increasingly assertive claims to almost all of it as part of an ancient imperium that they are proudly reviving. The boundaries of their historical claim are marked by a "nine-dash line"—a line made up of nine dashes, or strokes, that protrudes from China's southern Hainan Island as far as the northern coast of Indonesia, looping down like a giant lolling tongue. This line has always been something of a mystery. It was drawn up by cartographers of the former Kuomintang regime in 1946 in the chaotic final years of the Chinese civil war before the Kuomintang fled to Taiwan. And, in fact, the line started not with nine dashes but 11: Two were scrubbed out in 1953 after the victorious communists adopted the line. Scale and precision are prized by mapmakers, but the nine-dash line lacks any geographical coordinates. It looks as though it was added with a thick black marker pen. What's more, Beijing has never properly explained what it represents. Does China's claim to "indisputable sovereignty" over the scattered territorial features inside the line derive from the line itself? Or is it the other way round, with the line deriving from those territorial features and the waters that surround them? 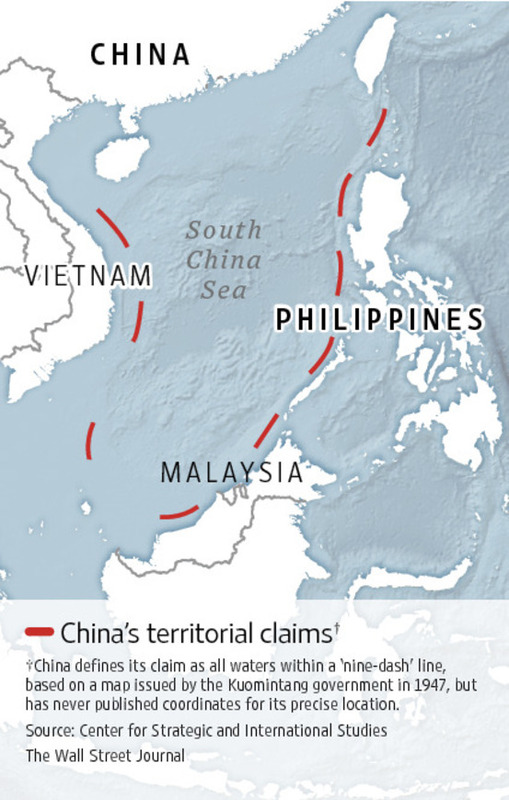 China's neighbors who dispute its territorial assertions—among them the Philippines, Vietnam, Brunei and Malaysia—are left to guess. For these reasons, the prevailing view among Western legal scholars has long been that the nine-dash line wouldn't stand much chance if it was ever challenged under international law. We may be about to find out. On Sunday, the Philippines filed the first-ever legal challenge to the line as part of a 4,000-page submission to a U.N. arbitration tribunal in The Hague. It wants the line declared as without legal weight so that it can exploit the offshore energy and fishery resources within its U.N.-declared exclusive economic zone. China has so far abstained from the proceedings. The landmark case risks a Chinese backlash. Already, Beijing has all but frozen political ties with Manila. 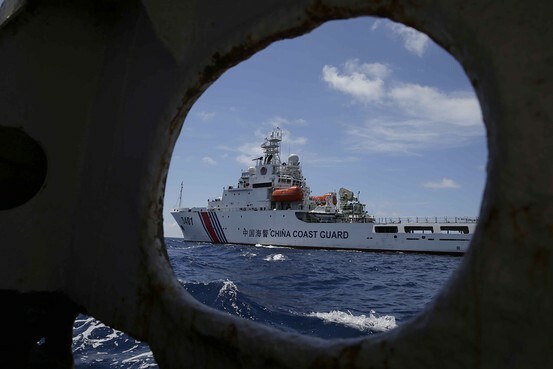 In recent days, Chinese ships have been playing cat-and-mouse games with Philippine vessels trying to reprovision marines stuck on a lonely outpost called the Second Thomas Shoal. But what's given the case even greater significance—and a potential for escalation to a strategic level--is that the U.S. has joined in attacks of the nine-dash line, dropping its previous diplomatic caution. 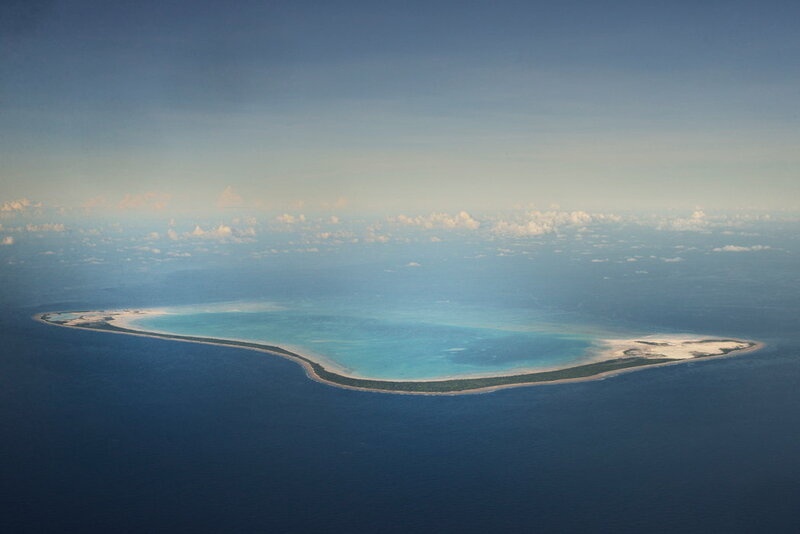 In congressional testimony in February, Daniel Russell, the U.S. assistant secretary of state for East Asian and Pacific Affairs, said that while Washington doesn't take a position on sovereignty issues, the way that China pursues its territorial claims by reference to the nine-dash line creates "uncertainty, insecurity and instability." He added that the U.S. "would welcome China to clarify or adjust its nine-dash-line claim to bring it in accordance with the international law of the sea." A Chinese Foreign Ministry spokesman retorted that "China's rights and interests in the South China Sea are formed in history and protected by international law." What prompted the American shift in rhetoric, says Paul Haenle, a former director for China, Taiwan, and Mongolian Affairs on the U.S. National Security Council, was China's decision last November to declare an Air Defense Identification Zone over the East China Sea, including disputed islands administered by Japan. Washington has since explicitly warned Beijing not to do the same over the South China Sea. It fears, says Mr. Haenle "that we'll wake up one morning and discover the whole region has changed." But altering the nine-dash line, as the U.S. suggests, may be politically impossible for Beijing. China regards the Philippines' action as a gross insolence. It's a slap at President Xi Jinping's much trumpeted "China Dream," a notion that implies the restoration of the country's imperial splendor, including its control over a sea that it regards more or less as its internal lake. If Manila prevails at The Hague—and it's not clear that the U.N. tribunal will accept jurisdiction over the case--China could simply ignore the verdict and carry on as before. The simplest solution would be for all countries concerned to shelve their territorial disputes and focus on joint development of the area's natural resources. But that's not the way the Chinese empire has traditionally worked things out. In past days, small countries like the Philippines knew their place—at the bottom of a regional hierarchy dominated by China. It is not likely to quietly allow Manila to upset that order. ChinaUSFocus : Is the Nine-Dash Line in the South China Sea Legal? RUSI : China’s New Map: Just Another Dash? Climate change: is anybody listening? The planet is poised for disaster, according to a landmark study released yesterday. Forests will burn, cities will flood and infrastructure will collapse under the strain of a warming climate. Climate change will also lead to increased food insecurity and even wars over resources, says the report by the Intergovernmental Panel on Climate Change (IPCC), which was set up by the United Nations' Environment Program. The report, written by more than 300 scientists and based on thousands of peer-reviewed research documents, says some of the problems of climate change can be mitigated if warming doesn’t continue on its current trajectory. Icebergs in a channel between Greenland’s Eqip Sermia glacier and Ilulissat Icefjord, the most active glacier in the Northern Hemisphere. 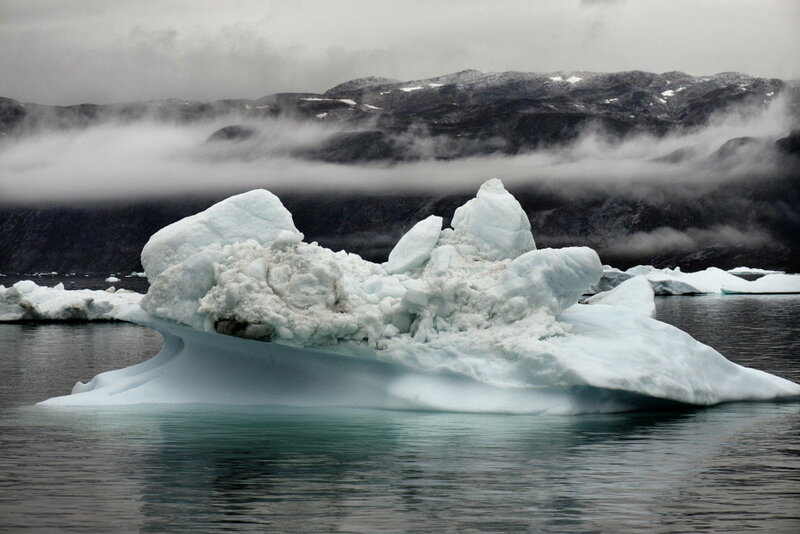 Greenland’s immense ice sheet is melting as a result of climate change. But as scientists issue yet another dire warning about the perils of man-made climate change, will governments take action? People concerned about the future of humanity hope so. But science and politics are separate topics. The two biggest greenhouse gas emitters, China and the United States, remain particularly stubborn on serious cuts to greenhouse gas emissions that could mitigate climate change. And the U.N. framework for a comprehensive approach to the problem remains mired in seemingly endless negotiations, despite increasingly urgent calls to action from the scientific community. “The IPCC performs an extremely important function but I would be surprised if their truth-telling was the magic formula to get countries moving,” says Ruth Greenspan Bell, a public policy scholar who works on climate change issues at the Woodrow Wilson International Center for Scholars. The report comes as preparations are underway for more international negotiations. There have been more than 17 high-level international conference in the last 9 years. In September, heads of state, business, industry and advocacy groups will meet in New York at the invitation of U.N. Secretary General Ban Ki-moon to discuss climate change. Next year, Paris will host the 21st United Nations Climate Change Conference, where governments from 195 countries will once again meet to establish emissions reduction targets. “This [report] was timed to come out before the build-up to the 2015 Paris conference,” says Robert Falkner, a professor of international relations at the London School of Economics who studies environmental negotiations. They could use a boost. In the past, climate change negotiations under the U.N. framework have been less than productive. In 2009, the Copenhagen Climate Change Conference was supposed to establish a binding agreement for deep emissions cuts that would keep global temperature increases below 1.5°C. Instead, the parties came up with a non-binding “accord” that calls on countries to “take note” of reduction targets. The weak agreement at Copenhagen—a disappointment to both poor countries who will bear the brunt of climate change’s effects and to some of the European countries that attempt to be leaders on the issue—was engineered by representatives from the United States and China, the world’s two largest emitters of greenhouse gases and the two biggest obstacles to climate change agreements. There may be some encouraging signs in the U.S. though. Secretary of State John Kerry said the IPCC report should be a wake-up call. “Unless we act dramatically and quickly, science tells us our climate and our way of life are literally in jeopardy," Kerry said. The Obama administration may hope to use the IPCC’s sobering warnings to galvanize support for carbon emissions-reduction plans in the United States, one of the few countries in the world where climate change deniers hold positions in government (in Congress and at the state level). The White House has increasingly turned to executive orders on climate change-related issues to circumvent an obstinate Congress. 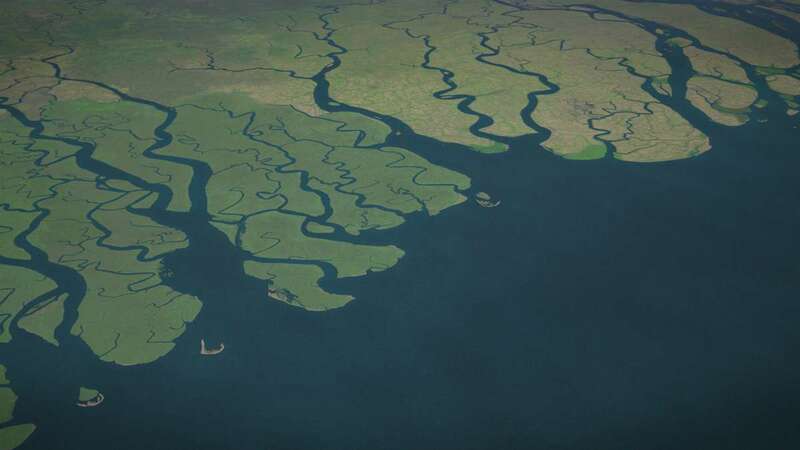 Some areas of the globe are especially vulnerable to rising sea levels. 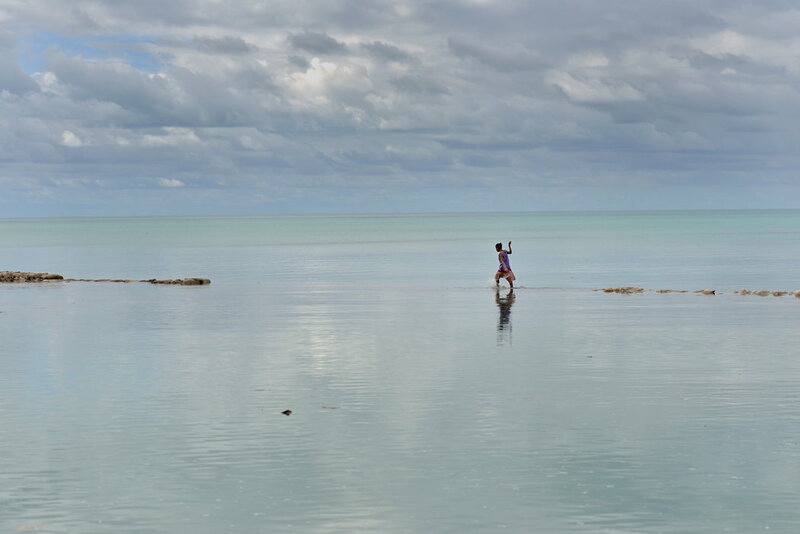 As land recedes under advancing waters, governments are faced with the costs of building defensive seawalls and relocating coastal populations — and in some extreme cases, finding new homes for entire island nations. But there is obstinacy across the world, too. China, the world’s largest emitter of greenhouse gases, is hesitant to agree to emissions targets that could curtail its rapid economic development and industrialization. “I don’t see any new flexibility in the Chinese negotiating position,” said Elizabeth Economy, an expert on Chinese environmental policy at the Council on Foreign Relations, of the upcoming climate change negotiations. China has reduced coal consumption as a percentage of its energy sources but the real amount of coal used has grown, as has the amount of greenhouse gas emissions per capita. Even as the comprehensive U.N.-backed talks over emissions reductions stall, there may be room for progress on mitigation efforts, some advocates say. And the IPCC report may help spur that. The report predicts that climate change could cut global economic output by up to 2 percent a year if temperatures rise by 2°C, which many scientists predict the earth is on track to exceed. More solid evidence and serious warnings like these shift businesses’ cost-benefit calculations, says Falkner, pointing to institutional investors and the insurance industry as particularly concerned about climate change. With international negotiations stuck in limbo, piecemeal changes may be the only path forward for avoiding the disastrous consequences of continued global warming predicted by the IPCC’s report. “There is no silver bullet for resolving this challenge,” says Bell. As a team of hundreds of scientists predicts an impending dystopia, it’s likely that many concerned people will to try whatever kind of initiatives might make progress. BBC : Climate report: Creating a sense of urgency or alarm? Do new satellite images show Malaysia Airlines debris or just garbage? The search for Malaysia Flight 370 is complicated by the wide spread of ocean garbage, much of which looks just like plane crash debris in satellite images. It’s a wing.… It’s a seat cushion.… It’s an icebox lid? The search for missing Malaysia Airlines Flight MH370 has turned up a lot of debris. Unfortunately, so far at least, none of it appears to belong to the missing Boeing 777. 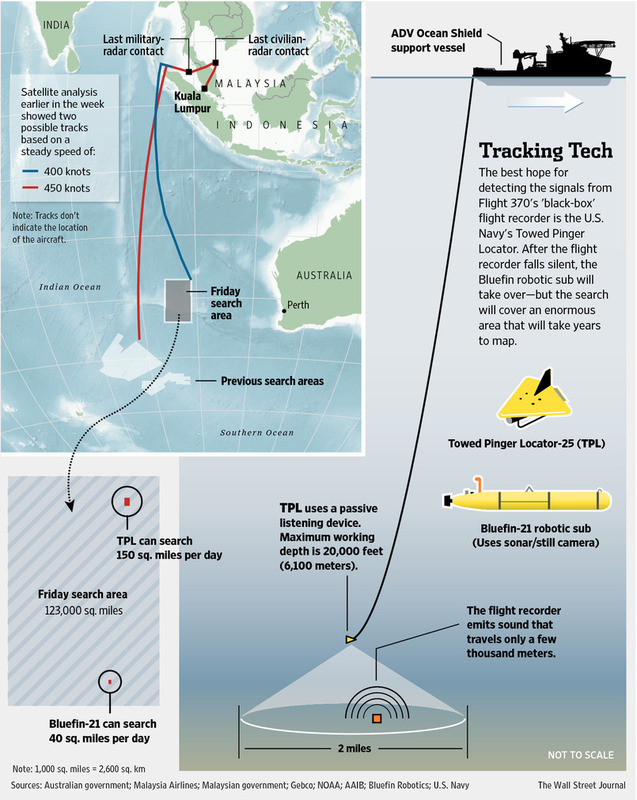 Vast quantities of trash bobbing around the ocean have made the Sisyphean search for wreckage from Flight 370 all the more complicated. In the weeks since the March 8 disappearance of the plane, searchers have darted about the Indian Ocean, following evolving analyses of radar data and potential clues offered by satellite imagery. Unfortunately, garbage floating on the ocean waves looks an awful lot like plane debris, says Malcom Spaulding, a former oceanography professor at the University of Rhode Island who has been involved in search and rescues since the 1970s. 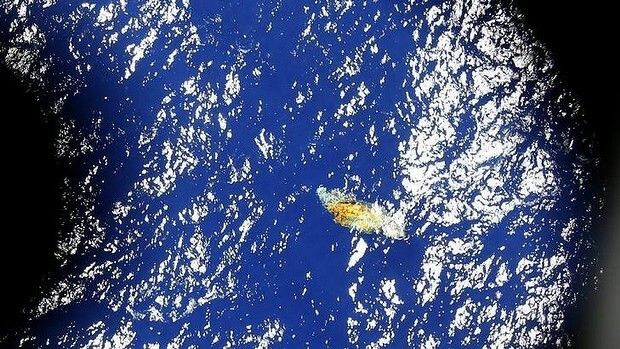 A picture taken off a computer monitor shows a piece of unknown debris floating just under the water that was spotted by a Royal New Zealand P-3 Orion while searching for missing Malaysia Airlines Flight MH370 in the southern Indian Ocean, Monday, March 31, 2014. The Orion crew could not identify the object and has sent images of it for analysis to the Rescue Coordination Center and Australian Maritime Safety Authority (AMSA). One of the major problems is that the ocean is littered with similar debris fields that resemble the expected scatter pattern of a crash, says Seattle oceanographer Curtis Ebbsmeyer, who studies sea-bound trash. “Everything that humanity does is reflected in the debris out there,” Mr. Ebbsmeyer says. Household garbage, remnants of space shuttle rocket boosters, spilled contents of shipping containers, and lost fishing equipment traverse the globe on the oceans’ currents, he says. The region’s currents run from the Cape of Good Hope across the Indian Ocean to the Western Australian coast, and north toward India before doubling back to Africa near Ethiopia and returning to the Cape of Good Hope, he says. It takes about three years to complete the circle. Ebbsmeyer likens the ocean and it’s currents to a mixing bowl filled with cake batter. “If you just stir slowly, you are going to wind up with patches of powdery stuff,” he explains. In this file imagery taken by the Thaichote satellite on March 24, 2014 and released March 27, 2014 by Geo-Informatics and Space Technology Development Agency (GISTDA), a part of about 300 objects floating in the Indian Ocean near the search area for the missing Malaysia Airlines jetliner are shown. Anticipation has repeatedly turned into frustration in the search for signs of Flight 370 as some of the objects spotted from planes in a new search area west of Australia have turned out to be nothing more than garbage. As a result, the ocean accumulates patches of debris. Some are massive and become islands unto themselves. The largest of these floating garbage dumps is the Great Pacific Garbage Patch, which is located about halfway between Hawaii and San Francisco. Scientists have found that birds living on Midway Island in the middle of the Pacific Ocean are eating that garbage. Scientists discovered a piece of wreckage from a 1944 plane crash in the stomach of an albatross in 2004. Bad weather and poor visibility caused the search to be called off early with the coast guard plane only completing one of its three 210 nautical mile legs. Scientists identified a similar patch in the Southern Indian Ocean in 2010. There are also hundreds of “little nano garbage patches” floating around the Indian Ocean, Ebbsmeyer says. Every time satellites find a new debris patch, searchers have to establish “ground truth,” essentially hop in a boat and head to the area to confirm that what the satellite depicted is as it appears. If they can find it, that is. Frequently, by the time boats can get to the new area, the objects spotted on the satellite image have floated away or sank. Last week, a French defense contractor satellite spotted a debris field containing 122 objects, including a 75-foot-long piece of something that commentators surmised could be the wing of a plane. Searchers systematically trawled the area but turned up nothing. While large portions of wrecks have been recovered in the past – search teams recovered the tail fin of Air France Flight 447, which crashed into the Atlantic Ocean in 2009 – more often, planes disintegrate into small pieces when they hit the water, says Robert Benzon, a former National Transportation Safety Board investigator who led the 1996 investigation into the crash of TWA flight 800 in the Atlantic Ocean. “The TWA plane plunged into the ocean from 13,000 feet and the wings shattered. They were in hundreds of pieces,” he says. That leaves the question, What was that 75-foot-long object? It could be any number of things, Ebbsmeyer says. Assuming the plane did break into small pieces, the debris field is probably spreading wider and thinner with each passing day. Ebbsmeyer estimates that the debris patch is probably more than 20 miles in diameter and spreading, based on his studies of container spills. “The debris is going to become less concentrated and harder to spot,” he says. Even if search teams are able to recover floating debris, chances are it is not hovering in place directly above the wreckage. Finding the main debris field and the flight recorder could take additional weeks of searching with automated underwater vehicles (AUV), Spaulding says. The US Navy’s Bluefin-21 AUV can help provide searchers a view of the sea floor using side scan sonar technology. However, the ocean floor can be just as littered with debris as the sea surface, NTSB’s Mr. Benzon says. When searching for TWA Flight 800, “we found a lot of stuff on the bottom of the ocean here that had nothing to do with the accident, including wrecks from other crashes,” he says. The UN court's decision, by a 12-4 majority among a panel of judges, casts serious doubt over the long-term future of the jewel in the crown of Japan's controversial whaling programme. It also marks a dramatic victory for the Australian government, whose four-year campaign to ban the hunts rested on whether it could convince the court that Japan was using scientific research as a cover for commercial whaling. In its 2010 application to the court, Australia accused Japan of failing to "observe in good faith the zero catch limit in relation to the killing of whales". Under the International Whaling Commission's 1986 ban on commercial whaling, Japan was permitted to kill a certain number of whales every year for what it called scientific research. The sale of meat from the hunts in restaurants and supermarkets, while not illegal, prompted accusations from Australia and other anti-whaling nations that Japan was cloaking a commercial operation "in the lab coat of science". In a lengthy ruling, the presiding judge in the Hague, Peter Tomka, said Japan had failed to prove that its pursuit of hundreds of mainly minke whales in Antarctic waters every winter – under a programme known as Jarpa II – was for scientific purposes. "The evidence does not establish that the programme's design and implementation are reasonable in relation to achieving its stated objectives," Tomka said. "The court concludes that the special permits granted by Japan for the killing, taking and treating of whales in connection with Jarpa II are not for purposes of scientific research," he added, before ordering Japan to cease its whaling programme "with immediate effect". "In terms of a future course of action, people in Tokyo will examine that, but we have made our position clear - that we will abide by the judgement," Shikata told the Guardian. He said the ruling would not affect bilateral ties with Australia. relations in many areas, so now it is important to ensure that our differences over whaling do not affect very good Japan-Australia relations as a whole." Shikata said he did not interpret today's verdict as an attack on Japan's culture. "We made references to cultural differences and dietary traditions, but this case was about the legality of the programme under the whaling convention," he said. "The court ruling referred, for example, to a lack of scientific basis for sample sizes ... it wasn't about cultural differences." "This is an historic decision which lays to rest, once and for all, the grim travesty of Japan's so-called 'scientific' whaling and exposes it to the world as the blatant falsehood it clearly is," said Clare Perry, head of the cetaceans campaign at the UK-based Environmental Investigation Agency. "With this ruling, Japan must clearly cease its whaling activities in the Antarctic." The court ruled that Japan had not complied with its obligations covering scientific research as set out in article 8 of the 1946 International Convention for the Regulation of Whaling. Japan, though, had maintained that its annual slaughter of 850 minke whales and up to 50 endangered fin whales every year was necessary to examine the age, health, feeding habits, exposure to toxins and other characteristics of whale populations, with a view to the possible resumption of sustainable commercial whaling. Officials in Tokyo said the data could not be obtained through non-lethal methods. Tomka, however, said Japan had not offered sufficient scientific justification for the slaughter of a large number of minke whales, while failing to kill enough fin and humpback whales to be of any scientific value. It had also failed to explore the possibility of gathering certain scientific data without resorting to killing the mammals, he added. In its defence, Japan cited only two peer-reviewed scientific papers relating to its program from 2005 to the present, during which it has harpooned 3,600 minke whales, a handful of fin whales, and no humpback whales. Tuesday's decision, though, leaves room for Japan to revamp its whaling programme to meet an international whaling treaty's requirements for scientific whaling. And it does not mean the end to all whaling. Japan also hunts a much smaller number of whales in the northern Pacific, while Norway and Iceland continue to kill whales for their commercial value, in defiance of the IWC ban. Japan has slaughtered more than 10,000 whales since the IWC moratorium came into effect, according to the Australian government. Japan had questioned the court's right to rule on the case, but said before the ruling that it would accept its verdict. The court's judgements are binding and cannot be appealed. Monday's ruling is unlikely to have much impact on the Japanese public, whose appetite for whale meat has declined dramatically since the immediate postwar period. In recent years, stocks of whale meat have remained unsold, with almost 4,600 tonnes stored in port freezers at the end of 2012, according to Japanese government statistics. Campaigners said they hoped the verdict would result in a permanent end to Japan's whaling programme in the southern ocean. "The myth that this hunt was in any way scientific can now be dismissed once and for all," said Willie MacKenzie, oceans campaigner for GreenpeaceUK. "We urge Japan to abide by this decision and not attempt to continue whaling through any newly invented loopholes." Greenwich Mean Time. A time of change: A change in time. Rebekah Higgitt is one of the curators of Ships, Clocks and Stars: the Quest for Longitude (11 July 2014-4 January 2015), a forthcoming exhibition at the National Maritime Museum marking the tercentenary of the first Longitude Act, and which includes the story of the Nautical Almanac and the development of marine timekeepers. It has become something of a tradition on this blog to mark the biannual change of the clocks and, although I no longer work at the Royal Observatory Greenwich, it’s a habit that sticks. * Our standard time is now in fact Coordinated Universal Time (UTC), derived from International Atomic Time but as close as darn it to GMT. Why Greenwich time? And what’s mean about it? Mean time is clock time. It is a regularised, idealised version of solar time that is tracked not by the apparent motions of the Sun, observed by shadows on sundials, but by a mechanical device that splits the solar day into equal parts. Mean time ticks away at the same pace no matter the season. The difference between the two is described by the equation of time. Establishing the relationship between mean solar time and apparent solar time only really became possible, or useful, with the arrival of the pendulum clock in the 1650s. This made the mechanical clock, for the first time, a scientific instrument. Christiaan Huygens, who developed the first prototype pendulum clock in 1656, was able to produce reasonably accurate tables of the equation of time in 1665. However, it fell to John Flamsteed to publish tables in 1672-3 that tackled the problem in what became the standard way. He provided the formula by which apparent solar time could be converted into Mean Time. Just a couple of years later, Flamsteed was appointed the first Astronomer Royal and moved into the newly built observatory in Greenwich. There, he and his patrons had installed state-of-the-art pendulum clocks by the best clockmaker available, Thomas Tompion. With observations of the Sun and the help of his tables, Flamsteed set these clocks to the local time: Greenwich Mean Time. Greenwich time became important because there were people measuring it and because other people made use of astronomical observations based on it. Flamsteed’s catalogue of stars, which was to become a standard reference work for the following decades, listed their positions based on Greenwich time. 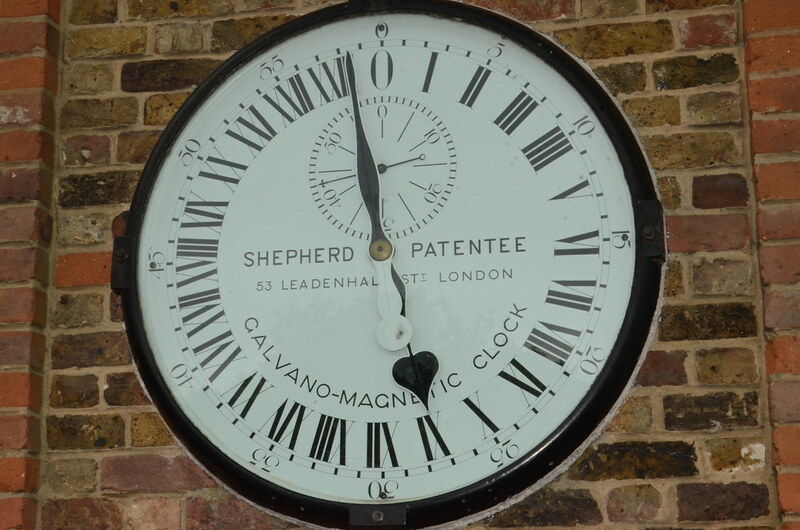 displaying Greenwich Mean Time to the public. It was one of Flamsteed’s successors, Nevil Maskelyne, Astronomer Royal from 1765 to 1811, who did most to ensure that GMT mattered to more than just astronomers. Under his initiative, observations made at Greenwich were processed into tables that could be used by navigators and cartographers to establish positions at sea or on land. This was the Nautical Almanac, first published for the year 1767. Surveyors of the Royal Navy and the Ordnance Survey relied on data that was based on observations made at Greenwich, meaning that their charts and maps used Greenwich as a reference point. More precisely, this was the meridian (north-south line) on which the chief telescope at Greenwich was mounted. The Greenwich meridian thus became a prime meridian for British mapping, and east-west position was measured from there. To establish longitudes it was necessary to know the difference between local time and GMT. This could be worked out with astronomical observations and the tables of the Nautical Almanac and, increasingly, with chronometers set to GMT. The move of GMT from the specialist worlds of astronomy, navigation and surveying into civilian life was down to the increasing role of technologies and cultures that demanded standardization. The arrival of railways made timetabling a necessity. Telegraph systems made it both desirable and possible to know what time it was elsewhere. Factory work made production and payment dependent on timekeeping. GMT became “Railway Time” in the 1840s, and Britain’s legal standard time in 1880. Despite what you’ll often read, it did not become an international standard in 1884. In that year an international conference did recommend the adoption of the Greenwich meridian as the world’s reference point for time and longitude, but it was just a recommendation. What actually happened as a result of the International Meridian Conference, and what did not, is a story for another post. See you back here on 26 October. Pléiades, the twin satellites operated by Airbus Defence and Space, captured the birth of a new volcanic island in the waters offshore Japan. In just two months, it had merged with a neighbouring island. The new island emerged from the Pacific Ocean on 21st November 2013, south of the island of Nishino, in the Ogasawara archipelago, more than 1,000 km south of Tokyo. The volcanic activity and expansion of this new territory were regularly monitored by the Pléiades satellites. The Geo-Intelligence experts at Airbus Defence and Space measured the growth of the island on three images taken over a two month period. On the first image, taken on 30th November 2013, the island measured 35,200 m² just 9 days after it first appeared on the ocean’s surface. The crater is clearly visible, as is the turbidity in the surrounding waters. The second image taken on 24th December 2013, shows the island had quadrupled in size in less than a month. 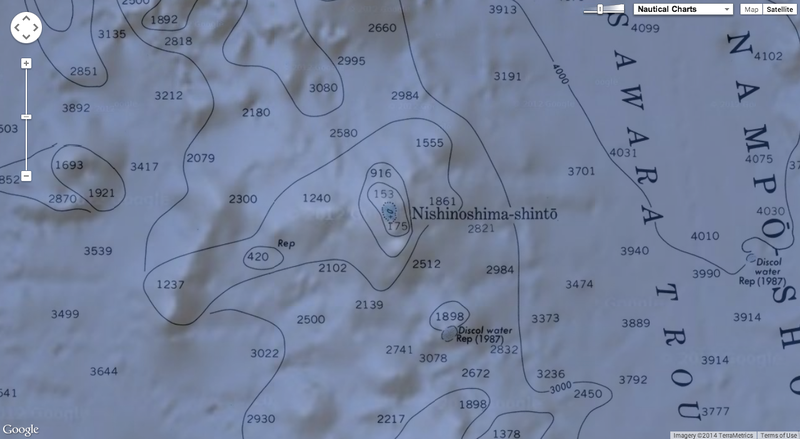 With a surface area of now 155,652m², Niijima island was approaching Nishino-shima the neighbouring island’s size of 223,402 m². The lava was only tens of metres from the southern beaches of the first island. The image captured on 29th January 2014, shows only a single island, measuring 622,978 m². The lava from the volcano had swamped the southern beaches. The merging of the islands took place in the shadow of the smoking crater. Airbus Defence and Space provides up-to-date and regular information thanks to the revisit capacity of its Pléiades and SPOT satellite constellations. Volcanic eruptions are generally monitored for risk prevention and management. This time, the satellites were mobilised to witness the birth of an island.